We know that young people take risks. An image of a group of teens drinking, smoking or skipping school may instantly form in your mind when you think about risky behavior. But risk-taking is not necessarily something to avoid. Teen brains are programmed for experimentation. We must build a culture of healthy risk-taking for youth. Research shows us that young people need to reach outside their comfort zones to try new things in order to reach their potential. 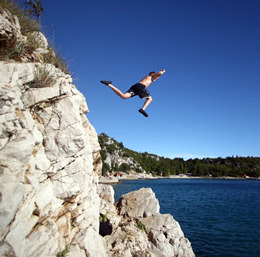 Taking healthy risks is a normal part of positive youth development. There are some steps we take before launching a ship, right? We also prepare youth for risks by scaling them up appropriately. For example a youth goes to a day camp first, and a three-day residential camp later. Or, a young person shows their projects at the county fair for a couple of years before taking one to the state fair. Additional preparation may take the form of more formal training. For example, we don’t throw our high school-age camp counselors into a three day camp, say “Good Luck,” and go home. We spend hours training them on youth development principles, leading activities and go through many scenarios. We have a staff person on site as a safety net. In other words, we provide a safe environment, with supportive adults, to take on the challenge of being a camp counselor. On an individual basis, you can take a mentoring approach. My colleague Joshua Kukowski shared about mentoring in a recent podcast. The highest quality youth development programs allow youth to explore and take advantage of risks that align with their individual developmental processes. Adults play the supporting role in this discovery process. Providing a safe environment to do this is part of program quality. Have you worked with a young person who needed support to take a risk? What ways to do you provide a safe place for youth to take a healthy risk? Thank you for your article. I noticed in the field that educators sometimes tend to dwell on making sure children are safe. Where as in this article I can see that risk is an important part of youth development, and that finding a healthy balance between safety and risk is essential to effective youth outreach. I appreciate the use of the word balance. Offering youth to step outside their comfort zone and do something that makes them a bit nervous and balancing that within a safe environment in something many youth development professionals work on each and every day! Karen, thanks for highlighting this topic. You are right that this need is intrinsic, especially in adolescents, and as youth development professionals we are well-positioned to help youth find relatively safe and constructive ways to take a risk. As we approach the State Fair, I think about all the pounding hearts and sweaty palms that will be part of the competitive experience...and part of young people learning they can take a risk and not only survive, but thrive as a result. I also have learned that for older teens, the challenges need to not only get more advanced but also more meaningful in order to keep them engaged. For example, I find the challenge of organizing a community project they care about might keep them more involved than easier activities where they don't have anything to lose. Thanks for raising this topic for us to reflect upon. A healthy risk is as unique as each youth. You mention State Fair and pounding hearts, but we also know youth who are more excited than nervous about that experience. That deeper challenge concept allows the content and depth to align with the individual needs of that young person.